The Unfoldment presents a body of sacred wisdom and an elegant system of spiritual practice that puts real power and real magic into the hands of those who seek a path of awakening. Neil Kramer draws on a lifetime of spiritual encounters and experiential gnosis to formulate a unique synthesis of metaphysics, mysticism, and esoteric knowledge—genuine, hands-on tools and teachings for transformation and enlightenment in the 21st century. The Unfoldment is a natural human process; a journey of growth, realization, and ascendance. 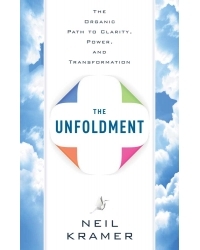 For the first time, Neil Kramer’s insights, techniques and, ideas are brought together in one inspirational work that has the power to change lives. Neil Kramer is a writer, philosopher, and teacher specializing in the fields of consciousness, metaphysics, shamanism, and ancient mystical disciplines. He has made a lifelong study of philosophy, indigenous wisdom traditions, inner alchemy, occultism, and esoteric world history. He shares his path of transformation in writings and interviews, and travels the world giving seminars, workshops and teachings. He has spoken at numerous international conferences on the nature of human consciousness and is a frequent guest on popular media networks. Neil is a renowned figure in the consciousness and alternative communities, recognized for his message of empowerment, lucidity, and spiritual insight. He lives near Hood River, Oregon.